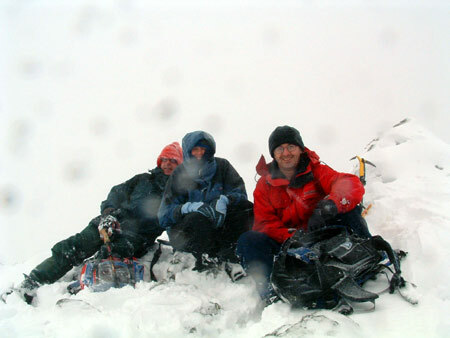 A small group of us had planned to do the Curved Ridge on Buachaille Etive Mor. A close eye was being kept on the weather forecast and as the days passed it looked increasingly likely that there could be snow on the higher tops. 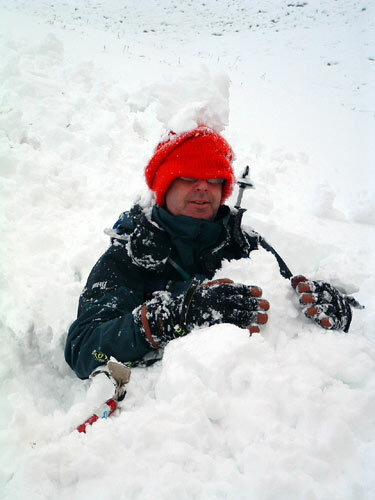 A slight mix up in communications led Fraser to think he was meeting us on Saturday morning in Kinlochleven rather than Bridge of Orchy. 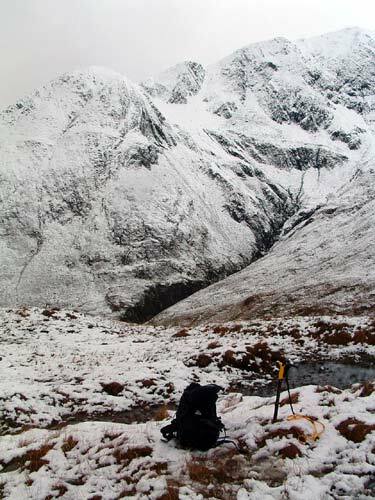 A couple of phone calls clarified the situation and we took Fraser's advice that the Curved Ridge was not a sensible option given the amount of fresh snow that had fallen the day before. 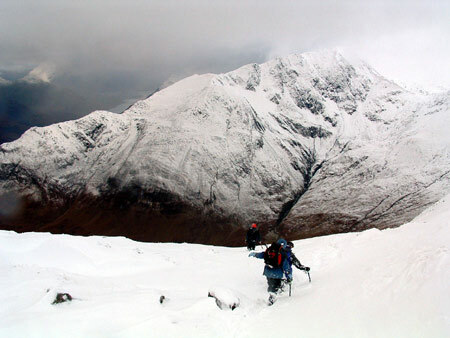 Fraser decided that he would do the westernmost Munro in the Mamores, Sgurr Eilde Mor. The rest of us had a discussion as we drove through Glencoe ranging from Ardgour to Aonach Mor before finally deciding to do Na Gruagaichean (or Na G for those of us who cannot pronounce it!) and Binnein Mor from Kinlochleven. This would give Alan an opportunity to bag Binnein Mor at the third attempt. And so we arrived at Mamore Lodge at around 9.30am and set off for Na G. We made steady progress, until we hit the snow. 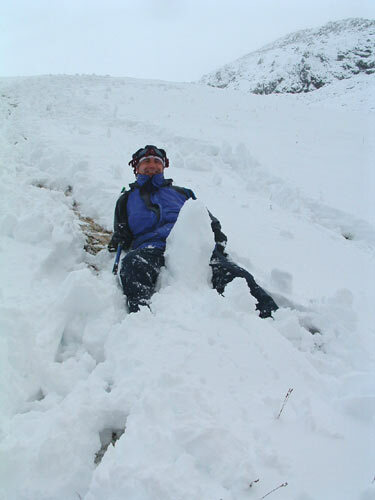 Despite my assertion that it would be just a dusting of snow we soon found ourselves knee deep in the white stuff. 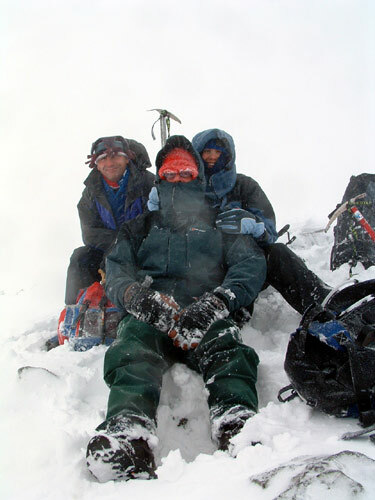 We took it in turns to lead our way up to the subsidiary top just to the east of Na G. We then experienced a complete whiteout for around ten minutes. 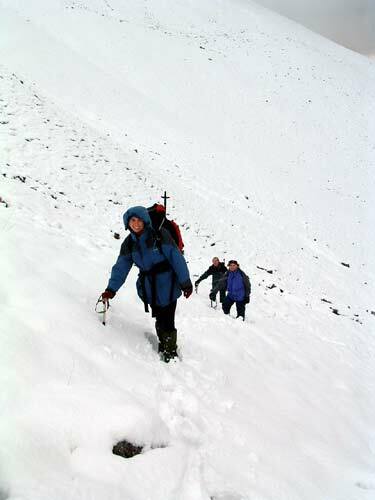 When it cleared we completed the ascent of Na G and decided that we would not attempt Binnein Mor, much to Alan's disappointment. 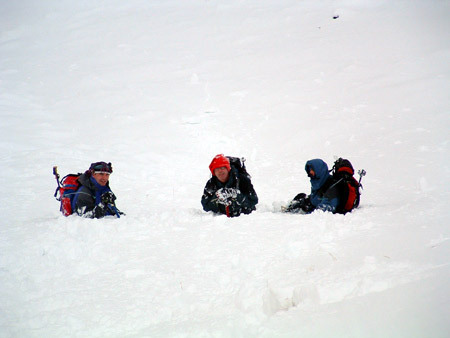 The descent was a careful affair at first but once we found ourselves on the lower slopes we had great fun trying to stay upright as we found ourselves waist deep in drifting snow. 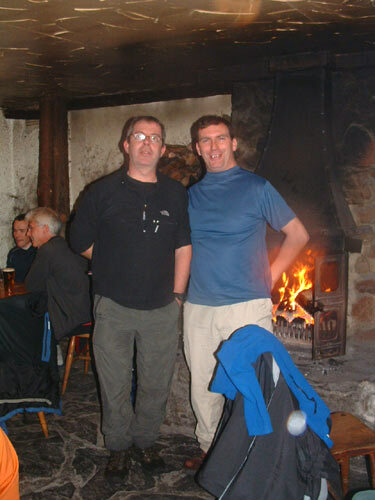 Eventually we hit the path back to Mamore Lodge and from there we made our way to the Clachaig for a couple of well earned pints as well the opportunity to dry out in front of a roaring fire. 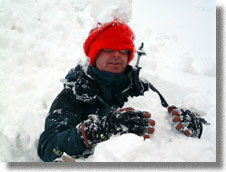 Hopefully some of the snow will finish up in the River Orchy for next weeks white water rafting trip!